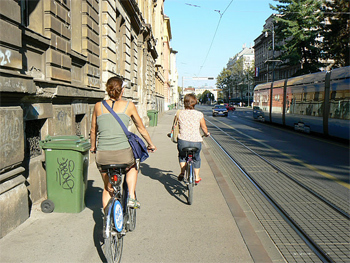 Biking the sidewalks of Zagreb, Croatia. The city of Zagreb, Croatia, is full of trees, and smells better than any other city of its size I've ever visited. Pedaling through the neighborhoods and downtown, the scent of baking bread, and flowers predominates. This landlocked capital city is best explored from the seat of a bike, since you can get just about anywhere and the car traffic can be bad. One of the first things she wanted to make clear was that the Croats look to the West, not the East, and they should not be confused with their Slavic neighbors in Bosnia or Serbia. Clearly, there is no love between these former war combatants, and she made this clear when she told the group, "We don't like being called Eastern Europeans!" The war that raged for four years between 1991-95 didn't hit Zagreb hard but destroyed many other towns in Croatia...but its most lasting effect is an intense dislike of Serbians and Bosnians by many Croats.On a September morning, I joined Alida Mezic, who runs Zabreb by Bike day tours with her husband Bruno. We'd bike around and discover the best parts of this city of about one million, and the capital of the twenty-year-old Republic of Croatia. A quarter of the country's people live here. The morning's itinerary, which began outside of the impressive Mimara Museum, which is right across the street from my hotel, the comfortable Westin. We later paid a visit to the Mimara and found floor after floor of treasures. Using their convenient e-guide that popped up on my iPhone it was easy to find out about every painting on every wall of the large and mostly empty museum. Zagreb is sliced in half by the gentle flowing Sava River, on one side is the vast area called New Zagreb, that was developed after the second world war, and on the other the thousand-year-old city, that has an upper and a lower area connected by an old funicular that runs two cars up and down. At the top is a spectacular view of the red-tiled roofs and the vast parklands this city is famous for. A park in Zagreb, Croatia. photo by Max Hartshorne. In this area, the neo-Gothic Zagreb Cathedral dominates the skyline, and according to our guide, she's never seen it without the somewhat distracting scaffolding adorning one or the other of its two tall spires. Renaissance walls surround the park and the cathedral, in places these have been converted into parts of buildings. Even with the requisite bums, it's a nice place to ride the bike, through the woody trails besides the ancient walls. Our city tour by bike would wind us around more of Zagreb's most famous landmarks, including the prominent squares, Nikola Subic Zrinski Square and Ban Jelacic Square where so many of Zagreb's young people congregate. There are impromtu art exhibits and music that pops up too...the day we rode by, a man was operating a backhoe and making it dance! We took in both the lower and the upper towns, and were permitted to pedal on all of the city's sidewalks, in the areas where there were no bike paths. People didn't mind getting out of our way. Other highlights of Zagreb are the big Stone Gate, St. Marco Square, the Strossmayer Promenade and British Square, where we just missed the assemblage of antique dealers who had packed it in for the day. 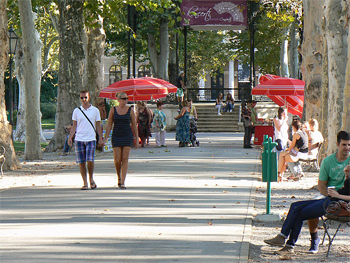 Zagreb is famous for its 'Green Horseshoe' a U shaped ring of shady, leafy parks that attract both pedestrians and bicyclists. This series of green spaces has Academies of learning, the university library and the National Theater in its midst. Most of these dramatic city buildings have the yellow color favored by long-gone Austro-Hungarian empire monarchs, and the architectural details are striking, with columns and crenelations that look similar to buildings in Vienna. Which makes sense since the same architects designed most of these buildings. 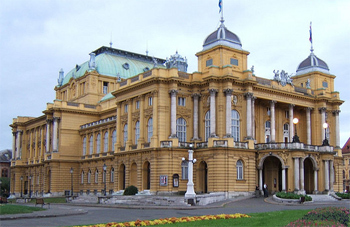 National Theater, Zagreb. 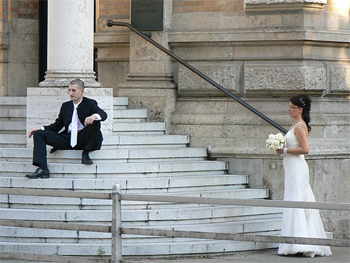 photo by Pennington. As we pedaled among the parks of the Green Horseshoe and around the other city attractions, the site of Zagreb's ubiquitous blue trams became quite familiar. 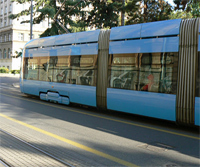 Citizens here are proud of the sleek modern blue trams, they are built in Croatia and it's hoped that someday soon they will be exported to cities in Scandinavia. It costs 8 Kuna, or $1.50 to ride the tram. It was once free for the first two stops, but the city now needs the money, so no free rides! A lunchtime stop took us off the crowded main thoroughfares into a tunnel, that opened up into a big leafy courtyard. This hidden garden is quite common in Zagreb, here we enjoyed the microbrewed beers, or Pivos of the Medvedgrad Brewery. 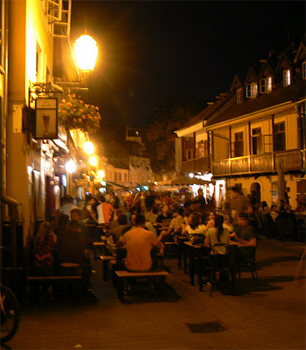 There are five breweries, or pivnicas, in Zagreb. The food is hearty, almost never served without potatoes, and the portions huge. We got a chance to sample a Zagreb staple, strukli, a strudel with cheese. One culinary delicacy that didn't impress me was their version of corn on the cob. There is a huge flat area of Zagreb that was developed after the second world war called Novi, (new) Zagreb. We pedaled out of the city center and over the Sava river to discover it. First we visited the city's Museum of Contemporary Art, a large flat building with a restaurant, the main entrance and a library all with separate access. It's a dramatic building that's been hailed by architecture fans the world over as pretty significant. 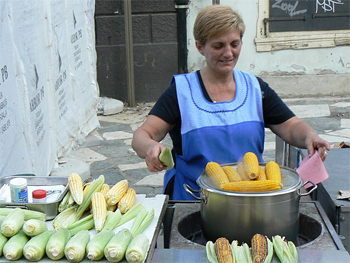 Corn on the cob is served all over Zagreb. Croats don't eat this vegetable at home, only from street vendors like this. The exhibits baffled me, as do many modern art collections, and these seemed to have many artists who enjoy taking their clothes off, including one very old gentleman who really should leave them on. Still, it was all interesting to wander through, and the fun part came when we slid down a long steel slide to make our exit to the first floor. Alida said her children especially enjoy visiting this museum! Navigating the cobblestone streets of Zagreb is a practiced art, since so many women wear very high heels. Novi Zagreb is also home to a caverous convention center called Zagreb Fair, and the newly built National and en route, we passed the University Library. There is also a man-made lake here where people enjoy swimming. My guide however, said she only swims in the sea, which is just about 90 minutes away from Zagreb by car. Croatia's best attractions, indeed, towns like Zadar on its beautiful coast, lined with hundreds of islands and is a far less expensive seaside destination than anything you'll find in neighboring Italy. We rode past a giant hippodrome, which was once the site of a Rolling Stones concert and more recently, the Pope, and up onto a pedestrian bridge back across the Sava. It was getting late and almost time to have coffee in London Park. Seeing a country like Croatia up close on a bike is one of the best ways to get to know it, and hiring an asute guide is a great first step. Zagreb, while not the biggest tourist attraction in Croatia (the seaside wins every time) is an interesting and inexpensive destination that has a lot to offer. "Blue Bikes," and are three-speed models with back pedal brakes and comfortable seats. Helmet? Only if you ask, despite the American nervousness about things like this. The tours cost HRK 170 or about 23 euros per person and last about four hours. The city is rockin' and the cafes are full all over the pedestrian zone of downtown Zagreb. 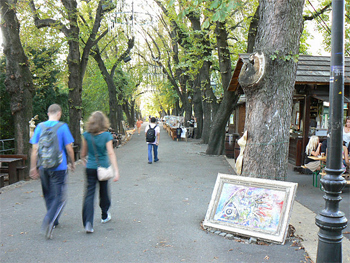 Artists work on display in the Upper part of Zagreb. Iceland Offers Nightlife, Deserts, Glaciers and a Lot More!